Did you know that an average American user looks at their smartphone 47 times a day? This fact wholly explains why the mobile app market has grown by almost 100% since 2016 and will continue to grow henceforth. The competition in the mobile segment of software development is off the charts too, so the sooner you turn your idea into a working application, the better your chances to lead in your niche. However, you probably remember that “cheap, fast, and good” triangle. It’s nearly impossible to build a profitable app for multiple platforms with native frameworks at short notice. But as the market evolves, new solutions emerge. One of them is Ionic framework (ionicframework.com), a hybrid tool that significantly reduces the time and effort needed to create a cross-platform mobile app. Ionic framework is an open-source software development kit (SDK) based on Apache Cordova and Angular. It mostly deals with “front-end” part of app creation, featuring a wide selection of UI components for designing neat and powerful native-looking apps and progressive web apps (PWAs). How exactly is it implemented? The app designed with Ionic is web- and native-based at the same time. On first glance, it is developed as a web application but with the ability to get adjusted to the particular phone specificities and generate a native app. This makes it a multi-purpose solution applicable to all popular mobile platforms like iOS, Android, and Windows. All of this sounds too great, so where is the catch? Being a so-called one-size-fits-all tool, Ionic framework might work well in most cases of mobile software development, although not ideal. Along with numerous advantages, there are a few drawbacks you should be aware of. + With first-class documentation and guidance, you can even try to develop a mobile app by yourself, if you have some coding experience; It’s possible to use all plugins and features of Angular, as Ionic is built on top of it. + The ionic team works with it on a daily basis, which makes your app run smoothly on any device. – Performance of the hybrid app is worse than the performance of the native-built app. However, it’s almost unnoticeable for the average user. – The app developed with Ionic framework requires additional security measures to be implemented, as it combines web and native elements. – Ionic isn’t suitable for heavy apps and mobile games. 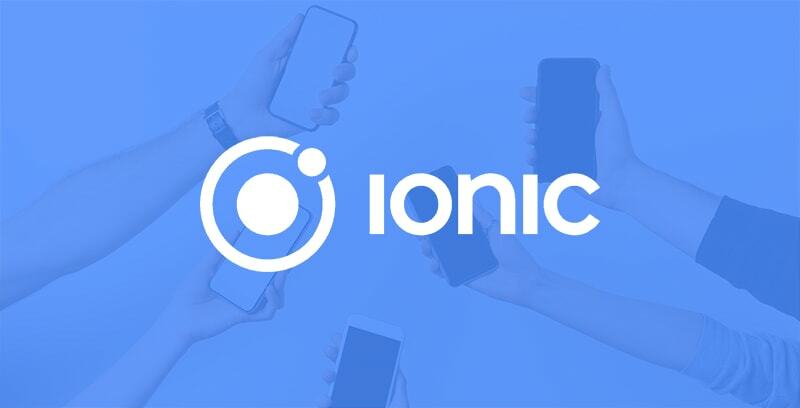 Ionic framework is a decent alternative to native app development if you wouldn’t mind sacrificing some performance and reliability in exchange for lower cost and less time spent on app creation. Yet, it would be unfair to overlook the Ionic’s primary rival — React Native, a Facebook’s renowned framework. As you could already understand based on its name, React doesn’t imply hybrid app creation and offers a compromise between native and hybrid approach, allowing you to build native-style applications. Can’t decide on which to choose? Take a look at the comparison table below. Mediocre performance due to the Webview technology in the core. Better performance than in hybrid apps, but worse than in native ones. Questionable reliability, as security is provided by 3rd-party plugins. Even more questionable reliability, as there are not many plugins designed for React Native. Requires JSX knowledge. The learning curve is longer due to fewer pre-made solutions. Sophisticated documentation with a lot of guides, how-tos, etc. Ionic allows developing apps for iOS, Android, Windows, web (including PWA), and desktop. React Native allows developing apps for Android, iOS, and WP. Only through Apache Cordova functionality. Direct access to the most of features, although some may require specific plugins. Testing available only in the emulator. The least possible time and cost expenditures if compare to React Native and native apps. Fast and affordable compared to native development, but takes time to catch up in some cases. Some people are still skeptical about the Ionic framework and can’t believe that it’s entirely possible to create high-end applications that work just as good as native. Let’s debunk this myth by providing a couple of examples of amazing apps fully built with Ionic. Untappd is a social networking app entirely dedicated to beer and everything related. Here you can discover brews, explore new venues, check-in every time you drink beer and communicate with like minds. The best thing about the app is its unique reward system that features numerous badges and awards. Pacifica claimed to be the #1 app for meditation and stress reduction in Apple AppStore and Google Play. It tracks your daily mood and offers personalized activities to improve your mental health and general well-being. The most popular techniques implemented in the app are mindfulness meditation, deep breathing, and muscle relaxation. Joule: Sous Vide by ChefSteps is one of the first apps developed with Ionic framework. It aims at assisting you in cooking with its cutting-edge features like Visual Doneness, precise control, and step-by-step guides. You can use Ionic anytime you need to release an app on multiple platforms. However, if you need an extremely powerful app with a lot of algorithms to implement, it makes sense to stick to native app software development. Also, it’s not desirable to build online banking and other applications that require high-grade security, as Ionic can’t fully ensure it without third-party plugins. If you still fluctuate between native and hybrid apps, give Ionic a try. The undeniable edge of this framework is that it is based on very common technologies, hence it won’t be hard to find a specialist in this field to build an app for you. Software outsourcing allows you to work with amazing talents without any recruitment efforts. Let alone the fact that working with overseas or nearshore companies is usually more affordable than hiring an in-house specialist or seek a freelancer on your own. Edgica is a dedicated team of software developers with versatile skillsets, so we can definitely provide you a specialist with expertise in the required area. Need help with Ionic? Building a hybrid app with Ionic framework is a no-brainer for our experts, as they usually work with more complex technologies such as IoT, mixed reality, and blockchain. Stop hesitating, drop us a message and enjoy a light-speed delivery of the top-of-the-line app for your business!